This week’s Nudge of the week comes to us from Greg Fischer, Broker/Owner of Fischer Real Estate Services of Fort Worth, Texas. Greg is a long time Nudge user and supporter, so it doesn’t come as a surprise to us that he’s always finding creative ways to use our product. As you can see by checking out the screenshot to the left, Greg is using Nudge as a way to follow up with other brokers whom have given feedback on his listings. In this case, he’s recommending they check out one of his new listings and has included some photos and a link to get even more photos and detailed information from his website. Well, the “big deal” here was the response that Greg got from a fellow agent about 10 minutes after sending that Nudge out. See the screenshot to the right taken directly from Marc’s iPhone. We created Nudge to get YOU results, and THAT’s the kind of response that we love to see! If you’re looking for a quick and easy way to produce marketing that can create similar results for you, you should give Nudge a try today. Looking for more inspiration or ways to fit Nudge into your marketing plan? **Join us this Friday at 10am (PST) for a “Getting to know Nudge” webinar where we’ll give you a quick tour of Nudge, show you some more killer examples, and share best practices for getting the most out of your digital marketing. Thanks for the highlight guys. Our scheduling service gives us the option to bulk email everyone who shows our listings. As someone who constantly gets these emails, I can assure you they usually go straight to trash. 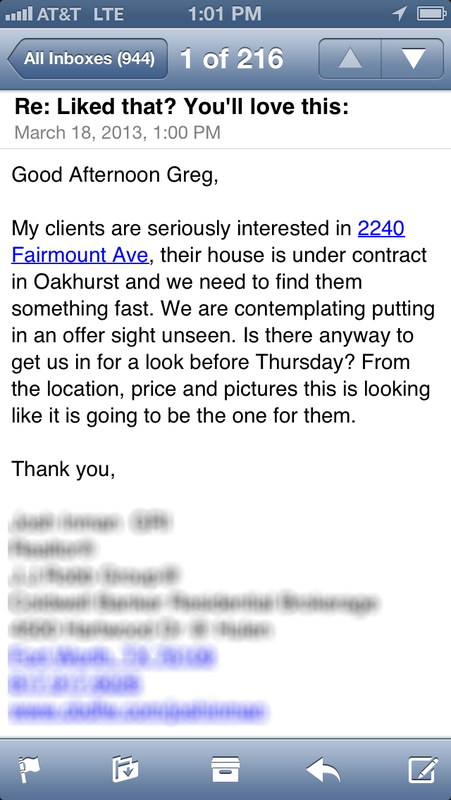 Which gave me an idea to use Nudge to better reach out to brokers (15) as we prepared to market a home in the same neighborhood as another one they had recently showed their clients. Since our new home had similar characteristics we knew that the buyers who had seen the other home were perfect candidates to find out about this one. Nudge ’em!